Beautify your bath with these graceful accessories: Holding bath beads or adorning a basket of greenery the elegant swans give the room a touch of tranquility. The easy-to-make basket trimmed with ribbons and lace offers a lovely caddy for potpourri or extra bath essentials. SUPPLIES FOR ENTIRE SET: Worsted weight yarn (refer to color key), two 10-1/2″ X 13-1/2″ sheets of clear 7 mesh plastic canvas, one 10-1/2″ x 13-1/2 ” sheet of white 7 mesh plastic canvas #16 tapestry needle, 26″ of l-1/4 w beading eyelet, 1-1/4 yds of 3/8 “w ribbon, and 24” of 1/8″w ribbon STITCHES USED FOR ENTIRE SET: Backstitch, Gobelin Stitch, Overcast Stitch, and Tent Stitch BASKET Size: 4-5/8″w x 6″h x 37/8″d Instructions: For Short Sides, cut two pieces of white plastic canvas 26 x 21 threads each. For Long Sides, cut two pieces of white plastic canvas 31 x 21 threads each. For Handle, cut a piece of white plastic canvas 7 x 51 threads. For Bottom, cut a piece of white plastic canvas 31 x 26 threads. Use white to join pieces. Join Long Sides to Short Sides along short edges. Join Bottom to Sides. Refer to photo to lace Handle on Long Sides and tack in place. Use white Overcast Stitches to cover unworked edges of Sides, joining Handle as you work. Cut a 28″ length of 3/8″ w ribbon. Refer to photo to thread ribbon through beading eyelet. Glue beading eyelet to Handle and around top edge of Sides. Cut remaining 3/8″ w ribbon in half. Tie each length of ribbon in a bow. Refer to photo and use white yarn to tack bows to Long Sides SWAN Size: 6-1/4 “w x 4-1/2″h Instructions: Follow charts and use required stitches to work Side A and Wing A. Use white Overcast Stitches to cover unworked edges. Use white and match ♦’s and ‘s to tack Wing A to Side A at ‘s and s. Refer to photo to tie 1/8″w ribbon in a bow around neck. Refer to photo for finishing ideas. 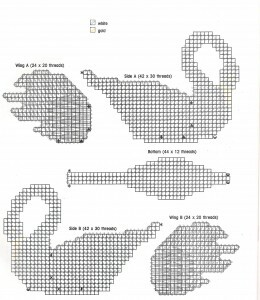 SWAN DISH Size: 6-1/4″w x 4-1/2 “h x 1-3/4 “d Instructions: Follow charts and use required stitches to work Swan Dish pieces. Use white and match ♦’s and ‘s to tack Wing A to Side A at ♦’s and ‘s. Use white and match ‘s and ‘s to tack Wing B to Side B at 1’s and x’s. Match ‘s and s to join Sides to Bottom along unworked edges of Bottom. Join Side A to Side B along unworked edges. Refer to photo to tie 1/8″w ribbon in a bow around neckBasket designed by Ellen Ruger. 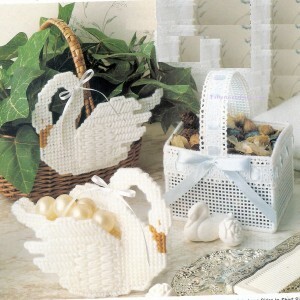 Swan and Swan Dish designed by Kooler Design Studio.